Welcome to Bethville! 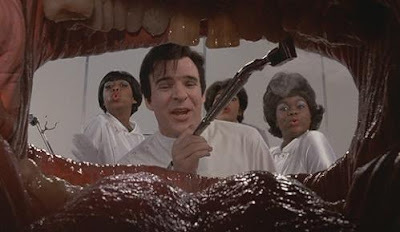 : Steve Martin Is a Terrible Dentist! Umm, I expect to see some "Jerk" posts as well. That was the creme de la creme of Steve Martin's career. That and LA Story. Lordy, is it getting hot in here? @Jenn: OF COURSE. I spent several minutes last night searching for the part with the paint cans. It's really hard to find for some reason. Can we get some "All of Me" up in here? The half-feminine,half-masculine walk alone is worth it. @MsDirector: OH! Of course! And The Man With Two Brains! There is just not enough time in this week to put up all the clips I want. Boo! Te he! I liked "Two Brains" Especially when Kathleen Turner sets the brain out in the sun and she loses some of the alphabet. Where do we see animals? "In a oo." Hehe. OK, I am so glad I am not the only one who was in love with Steve Martin back in the day. My sister and I were nuts over him, since "Three Amigos" was our favorite movie, and the King Tut song was the greatest thing I'd ever heard, at the time. @Jen: The part in Three Amigos when he is trying to get out of the dungeon. "Gonna make it. Gonna make it. Gonnamakeit. Gonnamakeit. Gonnamakeit."